1993: as near as i can figure, lobster dinners started christmas of my junior year of high school. the original guests included my parents and me. the menu has changed little since that first meal: lobster, baked potato, and a salad, although the salad dropped off in the early 2000’s because it just got in the way of the lobster, and wine became a more prominent component once i reached legal-ish age. the dinners were designed as a way to welcome in the christmas season by taking a moment to be thankful and grateful as well as serve as a collective “introverted” moment for the immediate family. our extended family (which had grown crazier over the years) would soon be upon us, bringing with them all the stress and drama that turned the three of us into angry little balls of crankiness that we usually “spared” our family from by taking it out on each other. lobster dinner was just us and something to look forward to while we were preparing for anything else. 1998: 1998 was a big year of change for the dinners. the first guest at lobster dinner happened out of necessity. although there was some brief talk of making my new boyfriend sit in the other room while we feasted, he had travelled to dallas with me to visit my family and that seemed rude, even for us. there was much joking about the “outsider” while we ate, but it was clear to everyone that he was a permanent guest. this was also the first and only year that lobster dinner occurred on christmas eve instead of a week or so earlier, thanks to the timing of our visit. 1998 was also the year that the lobsters started growing in size. 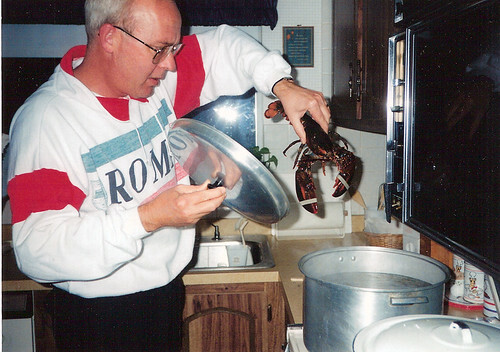 wanting to impress his guest (although he claimed this was all they had), my father bought slightly larger lobsters. the next year, when it was our turn to host, we didn’t want to “look bad” so we stepped up as well, likely with even larger lobsters. when it became my father’s opportunity again, he stepped up to show off, and so on and so on, until in recent years, one or more of us has been unable to finish our share. a decade later, the lobsters are a full pound larger than the original dinner, and that’s only because once you get over 2.5 pounds, they become hard to purchase and a logistical nightmare to cook (every year we tell the story of that one 5lb lobster my parents had back in the late 70’s). and because sometimes life is like a ridiculously contrived plot point in a “feel-good” christmas special, that strange pain in his stomach was pancreatic cancer and he died 5 months later. 10 days before his 61st birthday. 2007: lobster dinner added two more guests. the first was our daughter, who was less than 6 weeks old and might have been asleep before the bright red beasts made their way onto our plates. the second was my father-in-law. tragedy hung out for quite a while that year and my mother-in-law passed away as well. it just made sense to open the group up for him as well. i don’t remember much, thanks to the fog of new-parenthood, but i remember breaking a dish and finding it a few days later and generally being in a bad mood. i suppose it was understandable, given all the circumstances. 2008: tonight will be the first dinner back at my mom’s house since my father died. i didn’t really catch the significance of that until a few moments ago. while packing charlotte’s clothes for her over-night visit with grandma, i started telling her about lobster dinner and explaining some of it’s history to her. for a brief moment i couldn’t remember why her grandpa was coming. and then i did. and then suddenly i hated lobster dinner. lobster dinner 2006 was the last night with my family before Everything Changed. it is the last moment before a wave of harsh anniversaries starts assaulting my family and although the intensity fades around june, it doesn’t really let up until september. avoiding lobster dinner doesn’t avoid all of that, but there’s a small part of me that really wishes it would.